Jung an Tagen is practicing sonic animism on a molecular level. With ‘Agent im Objekt’ he confronts us once more with a form of highly abstracted electronic music - puristic clubsounds for an accelerated future. Kicking off with an accumulation of high-pitched, psychoactive sounds, ‘Agent im Objekt’ takes us into a hyperreal sphere reigned by sonic entities. 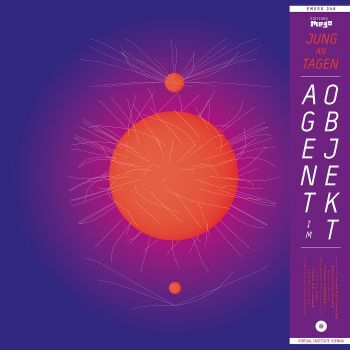 Playing with swarm-dynamics and singular signals, moments of distance and proximity and noise textures that stimulate our perception, Jung An Tagen transgresses the common syntax of clubmusic. His strategies resemble computer music composition and focus on timbre, texture and structure in an almost analytical way. The sounds filtered from his synthesizer are polished and bright, but behave in an astonishingly organic way, forming propulsive melodic sketches. Arranged in multiple layers of versatile polyrhythms, the tracks are nurtured by the forceful dialectics of precisely arranged chaos and ecstatic order. With his titles, Jung An Tagen is further adding an enigmatic narrative to his tracks, transcending the actual sphere of the dancefloor towards fictional storytelling. Following the structure of a one-sided chatlog, they evoke associations from the X-file series or mystery novels, revealing a brainteaser that is drawn from mysterious coordinates and secret codes. In addition the official video »20:03 [Y] HOW IS THAT POSSIBLE?« underlines Jung An Tagen's interdisciplinary interest in synaesthetic processes. Developed in collaboration with the programmers JeongHo Park and Scott Sinclair the video visualizes particle explosion data from CERN - the European Organization for Nuclear Research. Inspired by Peter Kubelkas ‘Arnulf Rainer’, the resulting geometric figures are exposed to a ’complimentary stroboscope’ that glitches your receptors and stimulate your brainwaves with photo- and EEG-stimulation close to seizure, inducing a hallucinative reality. ‘Agent im Objekt’ is playful but analytical, uplifting but mentally disturbed. While the dynamic use of reoccuring motives forces your body to move, cerebral timbres provoke a series of stimuli to massage your brain. It is intellectual body music that might mark a poetic turn in progressive dance music.